Changes to Ontario’s autism program set to come into effect April 1 have left some families of children on the autism spectrum struggling to determine how they’ll pay for expensive therapies. Some families say this funding model is unrealistic given that intensive therapies can cost up to $100,000 a year while the provincial government says it’s a much fairer solution. “We’ve heard how the autism program isn’t working for the families who need support for their children,” said Lisa MacLeod, minister of children, community and social services, when announcing the changes last month. He’s been prescribed 20 hours a week of therapy. His parents can barely afford the six hours he’s getting now. “It’s awful,” said Elliott’s mom, Jessica Knowles. “Imagine only being able to feed your child one meal a day when you know they need three. Imagine only being able to provide a roof over your child’s head and warmth one day out of seven days a week. Elliott’s diagnosis of severe autism — a neurological disorder that affects communication — was devastating. The attempt to treat it has been, too, Knowles said. The family was willing to do what it takes: wait, along with thousands of other families, for what they considered the light at the end of the tunnel: publicly funded therapy based on each child’s individual needs. But Ontario’s Conservative government intends to eliminate that program in favour of giving families money to fund treatment themselves. The amount each family will get depends on the age of the child and the family’s income. Programs are typically tailored to the individual child’s needs and involve intense one-on-one therapy, designed to teach language, communication and interpersonal skills to help children integrate into school. Since autism is a spectrum disorder, the number of hours needed depends on the severity of each child’s diagnosis. For others, such as five-year-old Lauren Yakeley, the 35 hours a week she’s receiving now help her learn basic life skills, such as putting a fork to her mouth. It’s therapy provided under Ontario’s publicly funded autism program that Lauren fears she will lose when the new program goes into effect. “They say it takes a village. Well, the government, our village, is basically saying we don’t care about your kids,” said her mother, Lisa Yakeley, a sob catching her voice. Knowles and Yakeley are two of the voices in a YouTube video created by Maritza Basaran, who’s three-year-old son, Harrison, was recently diagnosed with autism. Basaran put out a call to a Facebook group made up of parents of children with autism to share their stories. “The goal of the video is to show the general public what [Ontario Premier] Doug Ford and his minister are doing to ‘clear the wait list,'” Basaran said. The video is just one form of protest. 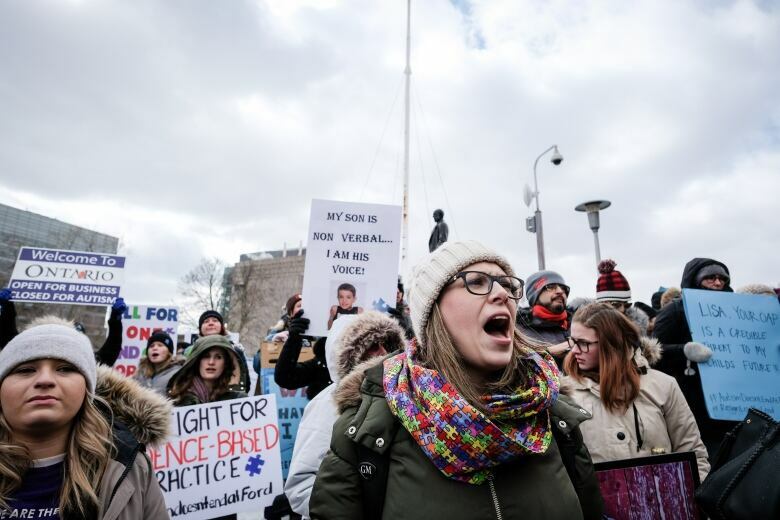 From the rally at Queens Park in Toronto last Thursday to a standing protest outside MacLeod’s Nepean, Ont., riding office, parents have been defiant and desperate. It’s a whole new window into his world, and it’s getting wider every day, she says. To lose the fully funded program means losing his potential, said Clayton. “Devastated doesn’t even come close to how we’re feeling,” Clayton said.